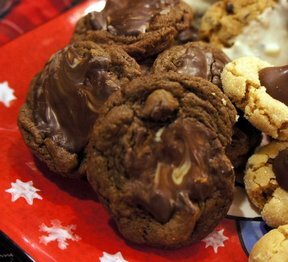 This reinvented version of the favorite holiday cookie features a gingerbread cookie with a white and milk chocolate swirled kiss-shaped candy. 1. Mix flour, ginger, cinnamon, baking soda, nutmeg and salt in large bowl. Beat butter and brown sugar in large bowl with electric mixer on medium speed until light and fluffy. Add molasses, egg and vanilla; beat well. Gradually beat in flour mixture on low speed until well mixed. Press dough into a thick flat disk. Wrap in plastic wrap. Refrigerate 4 hours or overnight. 2. Preheat oven to 350° F. Shape dough into 1-inch balls. Roll in granulated sugar. Place 2 inches apart on ungreased baking sheets. 3. 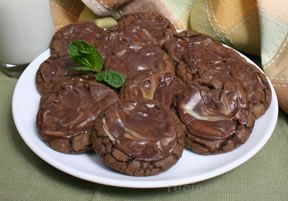 Bake 8 to 10 minutes or until edges of cookies just begin to brown. Immediately press a chocolate candy into center of each cookie. Remove to wire racks; cool completely. Store cookies in airtight container up to 5 days.